Add football to the long list of reasons why I love Fall. I love watching a game with my hubby on the couch while we’re in our pajamas. Wow, that sounds boring and lame. Eh, I love it. Of course this means that I’m starting to crave “football food.” You know, beer, pizza, chips and dip, and chili. 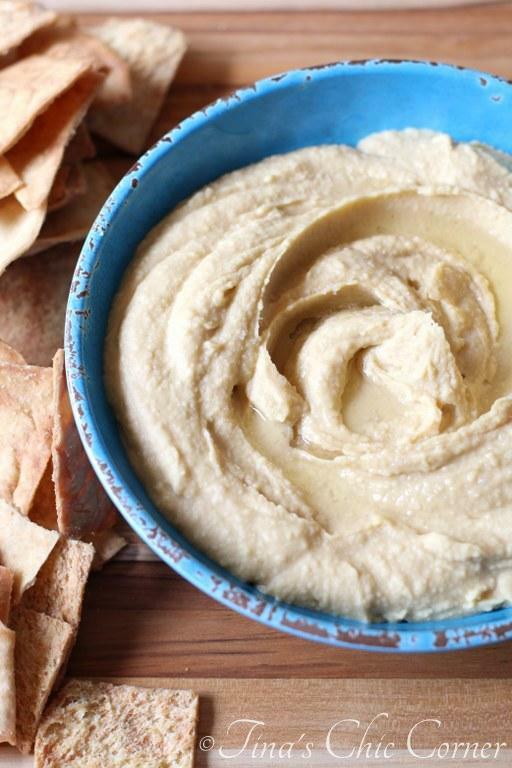 Hummus is the perfect dip to have at any party (even a party of 2). 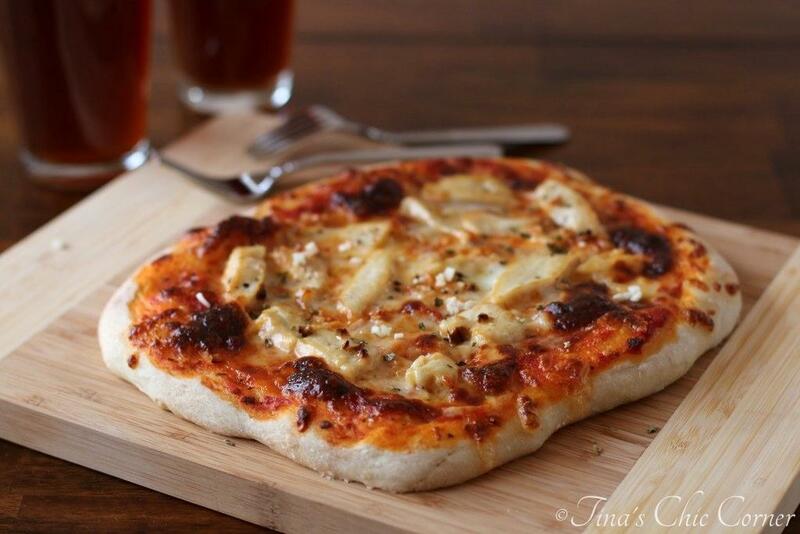 It’s delicious and you can make it ahead of time. I whipped up a batch of our favorite hummus recipe, but this time I added a twist and combined it with avocado. It was superb! If you’ve ever had flavored hummus before (like all the different kinds you can get at the grocery store) then you know that the hummus tends to overpower the other flavors. So as a heads up, you’re going to taste mostly the hummus here. Delightful chick peas and garlic. I’ve made sweet potato fries in a variety of flavors. This time I decided to go herb-y and add fresh garlic and basil on top as sort of nod to the end of summer. Fresh basil is difficult to find in the winter time (unless you want to spend mucho money, which I don’t) so I’m using it as much as I can while it’s still reasonably priced. The garlic and basil were a lovely compliment to the avocado hummus. Of course it’s not required that you eat it with the hummus, so if you have another fantastic use for sweet potato fries in mind, don’t let me slow you down. I always bake my sweet potato fries because we don’t own a fryer, which is on purpose because my waistline would hate me. Every time I make them, I bake them the same way and every time they come out slightly differently. Usually they come out crispy, but this time they were a bit soft. In fact, even attempts to over-bake them failed to crisp them up. I believe the secret is the cornstarch. This time I used a bigger than average sweet potato and I should have added more cornstarch to accommodate the sheer amount of material there was to coat. They still came out delicious. A t the end of the day you’ll have to be the judge of how much cornstarch to use based on the size of your sweet potato. That means I also have to be a better judge in the future too. My husband tried to warn me that it didn’t seem like enough, but I stuck with the recipe. Next time I’ll try to use a little more “feeling” than “logic” and I’ll probably get better fries for it. Toss the sweet potato pieces in cornstarch. The goal is to lightly coat them so you want to see some white powder on them but nothing extra at the bottom of the bowl. 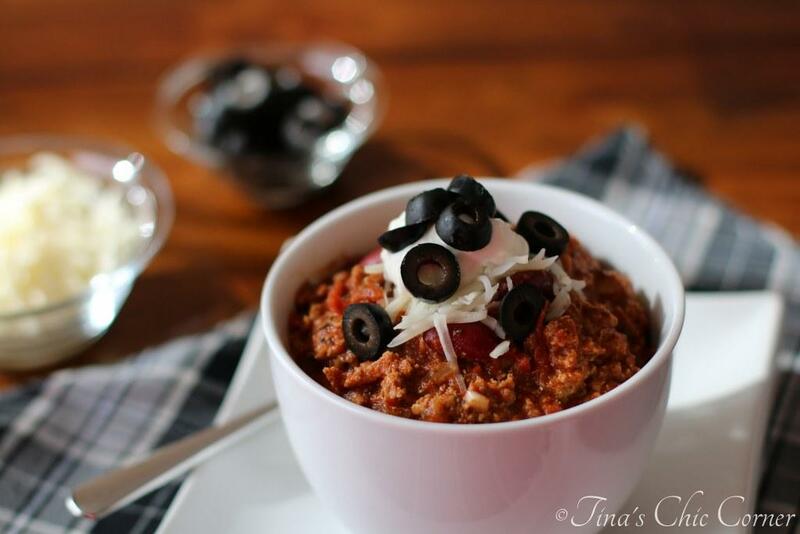 Start with 1/2 a tablespoon and add slightly more until you get to the goal. If the cornstarch disappears completely you probably haven’t used enough yet. 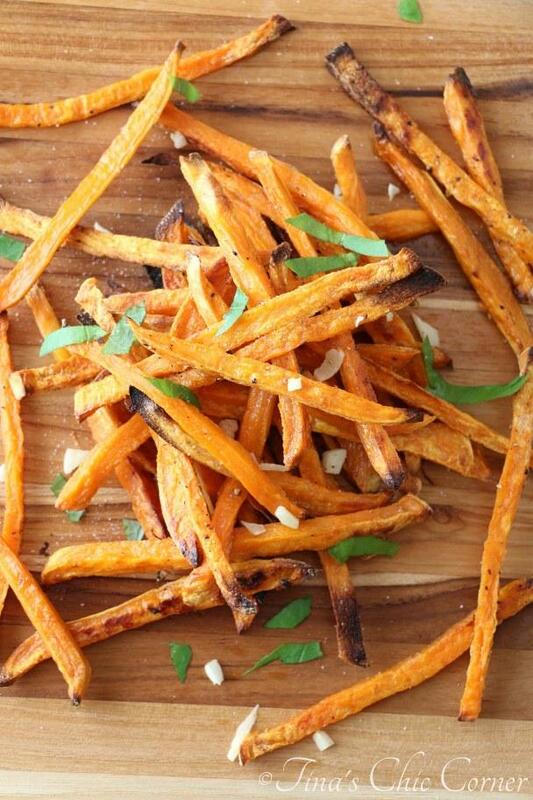 Toss the sweet potato pieces in 1 tablespoon olive oil. Season the sweet potato pieces with salt and pepper. Lay the sweet potato pieces in a single layer on the prepared baking sheet. Bake them for about 30 minutes, or until golden brown and crisp. Flip the sweet potato pieces about half way through the baking time. As soon as you remove the fries from the oven, sprinkle them with the minced garlic and chopped basil. Combine the drained and rinsed chick peas, 1/8 cup lemon juice, olive oil, garlic, and salt in a food processor and process it until it’s smooth. Remove the hummus from the processor into a serving bowl. Then combine the avocado and 1/2 tablespoon lemon juice in a food processor and process it until you get the consistency you want it to be. I prefer the avocado mixture to be a little more chunky than the hummus. Add the avocado mixture on top of the hummus and swirl it around. You can’t go wrong here. Mix slightly or combine completely or get something in between and it will taste delicious no matter how you do it. Sprinkle the toasted sesame seeds on top of the mixture. Here are some other fantastic football foods.